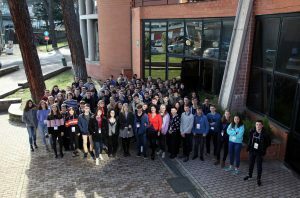 It will be held on April 1-5, 2019 – at Frascati National Laboratories – the INternational School on modern PhYsics and REsearch – INSPYRE. Now in its ninth edition, the LNF school is going to welcome several institutes from different Italian regions and from all over the world. The course – which will be entirely in English – consists of 5 days full of lessons and hands-on activities designed to bring the students closer to the challenges of Modern Physics and quantum technology. Its program aims at getting the students interested in Physics and also at showing the various applications from scientific research to highlight the extremely close relationship between Science and Society. Moreover, LNF researchers will involve the participants in a series of educational laboratories and will guide them during the visit to the accelerators and the main experimental apparata to discover more closely the fascinating world of Science. Thanks to its intercultural frame, this initiative is not just a chance of didactic enrichment, but also a valuable growth experience in humanistic terms. Applications must be submitted by filling the apposite form within the 15th of December 2018. There are still some seats available for foreign schools.